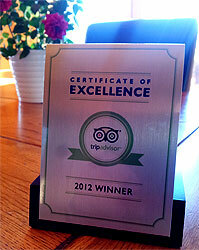 We received a surprise parcel in the post the other day, inside was a small plaque from TripAdvisor to display in our chalet commemorating our achievement of winning a Certificate of Excellence for 2012. I’m sure they’ve already sent me a certificate, although I’m not sure where I put it ! But it’s good to see the gifts are getting bigger, first a paper certificate, second a small plaque, I wonder what could be next ? Maybe a giant banner to hang outside the chalet ? Anyway thanks again to all our guests from last ski season who took the time to write all the fantastic comments we received. Looking forward to another great season and to welcoming more guests to Chalet Les Trois Canards. We had a little snow falling in Chatel a couple of days ago and the mountains are currently all white, winter is definitely just round the corner now. I’m busy working my way through my to-do list of everything that needs doing before the winter. Get in touch if you’re thinking about your next ski trip, we’ve still got several weeks available and would love to show you why we won our Certificate of Excellence.